'Sligo is surprising,' says the tourism slogan - and indeed it is! 'Benbulben? Is that where the sheep hang on with one hand and eat with the other,' an American once inquired of me. Perhaps they do. Anything is possible here! From our first glimpse of this unique mountains' towering limestone slopes, our imagination is captured. Even in a land already distinguished by unsurpassed scenic beauty, this natural monument at once marks County Sligo as unique. 'I have the same sort of feeling here that I've had when looking at the pyramids - of something which has seen a lot and knows a lot,' is how the writer, Owen Tweedy, put it. The poet W.B. Yeats was no less enthusiastic: 'The place that really influenced my life was Sligo,' he wrote. His brother Jack, who painted many of its moods and people was equally pasionate: 'Sligo was my school; and the sky above it,' he enthused. These remarkable brothers had a lifetime love affair with the county that has been reciprocated in full measure. In the form of the Yeats International Summer School that, each year, attracts Yeats devotees from all over the world, the romance continues. In Drumcliffe churchyard, under 'bare Benbulben's head' the poet's bones are laid to rest in the Sligo soil he loved so well. Today, Sligo is a flourishing commerical industrial and marketing centre, the largest town in the North-West with a population of about twenty thousand. Situated at the mouth of the Garavogue River, flowing from Lough Gill, it is surrounded by mountains- Benbulben (526m)) and Truskmore(645m) to the north. Queen Maeve's Knocknaera to the West and the Ox mountains to the South. Sligo Town is a vibrant and lively region and home to a great selection of accommodation, pubs, restaurants and cafés. If you are looking for warm hospitality and experience Irish culture first-hand, then Sligo is the place for you. It's hotels and B&Bs are renowned for its friendly hosts and comfortable surroundings that offer modern facilities, whilst retaining their cosy home from home appeal. This website will provide you with many useful links to further information. As it is vitally important to find a convenient hotel in advance of your visit it will also provide you with multiple choices of accommodation in Sligo. Click HERE to make the best choice in choosing your accommodation options. Planning a family get-together? A company outing? Can't think of an original gift to give for a birthday, wedding or anniversary? A gift certificate of a day trip to Inishmurray is the ideal answer! Remote and mystical Inishmurray is uniquely preserved as an early Christian site and wildlife sanctuary. Vestiges of pagan and Christian beliefs abide here in harmony. A sealwatch tour allows you to observe the thriving seal colony off the Sligo coast. Photo courtesy John Fitzsimmons. ‘Excalibur’ is Dept. of Marine licensed to European safety standards. 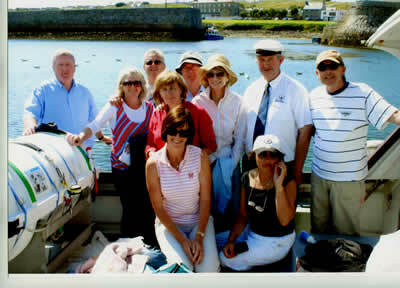 A distinguished visitor to Inishmurray, July 2006: Jean Kennedy-Smith (third from right) and friends; beside her, skipper Keith Clarke and Director of National Museum Pat Wallace. Mullaghmore harbour in background. 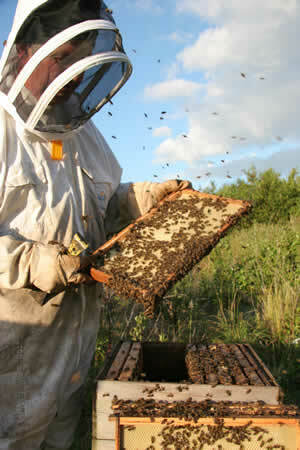 Skipper Keith Clarke's sideline is beekeeping (picture left). His apiary produces some of the finest honey in Ireland: Pot, Section, Cut-comb, Light flower, Dark blossom, Chunk, Heather, Granulated and Creamed honeys. This year the yield was exceptionally fine from an unusually profuse flowering of whitethorn which is said to occur once every seven years. 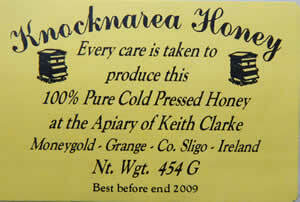 Honey from whitethorn blossom has especially curative properties.